For as the rain and the snow come down from heaven, And do not return there without watering the earth And making it bear and sprout, And furnishing seed to the sower and bread to the eater; So will My word be which goes forth from My mouth; It will not return to Me empty, Without accomplishing what I desire, And without succeeding in the matter for which I sent it. Randy is challenging us to make a card or project that depicts weather such as: rain, snow, ice, sunshine, wind. Anything that demonstrates weather. I used the Moxie Fab Tues. 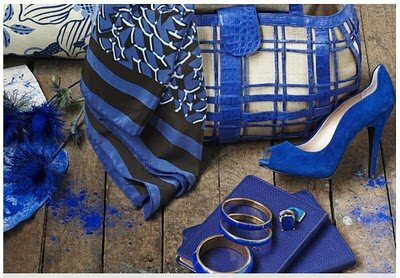 Trigger for my color scheme (from O Magazine) and chose the theme of snow for my weather. I used this month's Our Daily Bread designs new release Snowflake Background and the sentiment from Mistletoe Tag set as well as the Tag Die Cut. Talk about a quick easy way to make your Christmas cards! Stamp a card, add some ribbon and texture, a little bling and you are done! These could easily be mass produced! The ribbon is from AC Moore. The bling is Recollections. Card Stock and Ink are SU! After I assembled the card I spritzed it with Shimmerz Angels Wings for some shimmer. I hope you can see it a little bit. Our Sponsor this week is Heartfelt Creations~ If you have not explored this company, you should! Awesome stamps folks!!! I have some on my Christmas list!!! We are sorry to have to say that Cindy has stepped down from the DT. We will miss her! For the full devotional and challenge details please visit the Stampin Sisters in Christ Challenge. I hope you have time to spend in God's Word today and see what it might be that He wants to say to you through it! Have a blessed week! Layers of ColorDesigner Blog Hop! I and the other designers will be choosing one blessed winner from those who comment on our blog hop posts tomorrow! Challenge with 2SKETCHES 4YOU, and amazing stamped artwork! Starting on Layers of Color blog ~ See you there! Randi, this is beautiful! I always enjoy checking out your site and hearing your heart, your goodness and caring always comes through! Have a week filled with blessings! Becky that is too cool!!! Thanks for letting me know that! Made me smile!!! This is gorgeous Grace!! 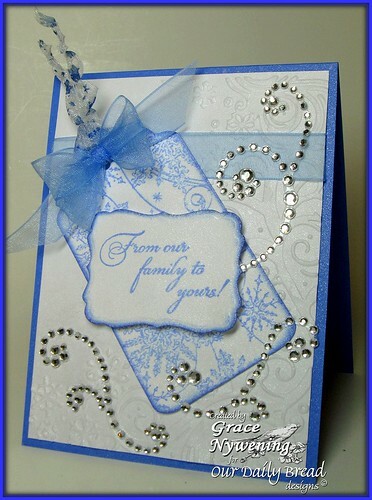 I just love the blue and all the rhinestones against the textured white. So elegant! Grace, this is so beautiful! The added shimmer is so pretty!!! What a gorjuss card - good luck with the challenge! Beautifully wintery colours - a really pretty Christmas card! Grace your card is truly beautiful...love the colour combo and those little gems are just fab!! Thanks for joining us at Paper Sundaes this week. Your blog is wonderful...full of good things!! I am so excited that you contacted Kathryn and were guests on her show tonight! I love all of your blogs and your professions of Faith. I am not ashamed of the gospel of Christ for it is the power of God unto salvation. Thanks so much glad you found us and we found you! oh wow! fabulous card - it sure feels snowy :) great use of ribbon too! What a great visit to your site Grace, it started with a warm smile at your music selection, the lovely blue and white confection you made, and a chuckle at Miesje's comment calling you Randi. :} Have a blessed week dear sister. Very stylish and elegant card !